Waiting for the first signs of spring is always an exciting time of year. 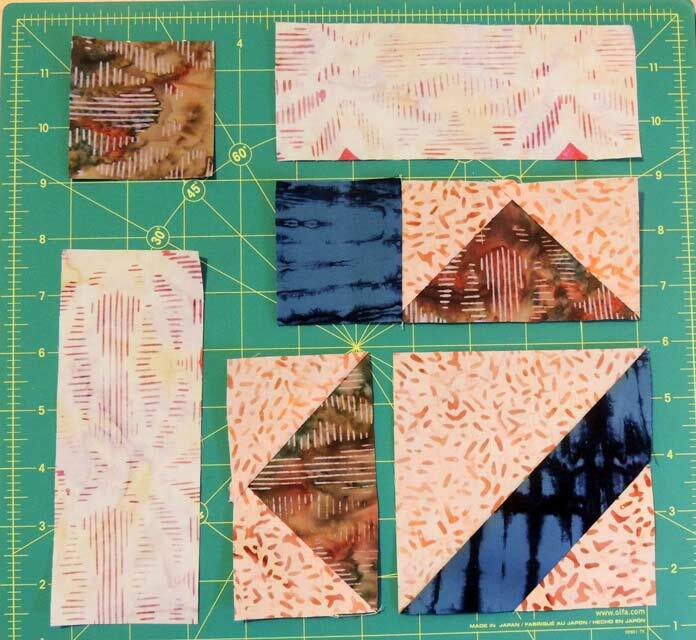 In yesterday’s post we cut up and put together again Banyan batik fabrics to make units for the batik quilted cushion cover. It’s fun to watch the fabrics change and bloom into something new with each seam! Today we’ll create the blocks that start to reveal the final cushion front. To start, lay out the units required as seen in the photo below. 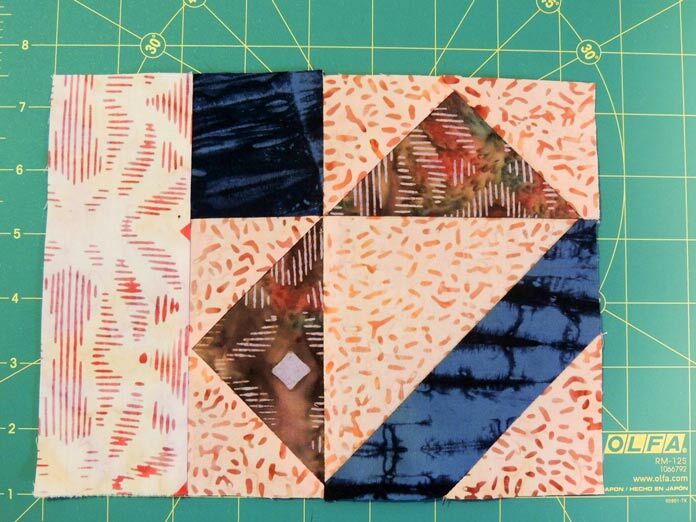 The Banyan Batiks really start to show their personalities as they are placed beside each other in this block. 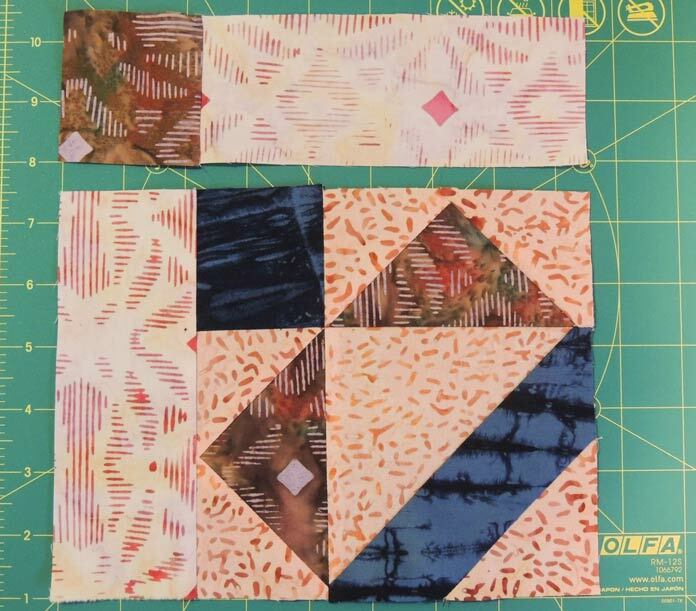 You can layer 4 of each unit as we’ll be making four identical corner blocks. 1. Sew the long geese edge of a Fabrics BC flying geese unit to the Fabric C long edge – see photo for orientation. Press the seam to the Fabrics CDC square unit. 2. 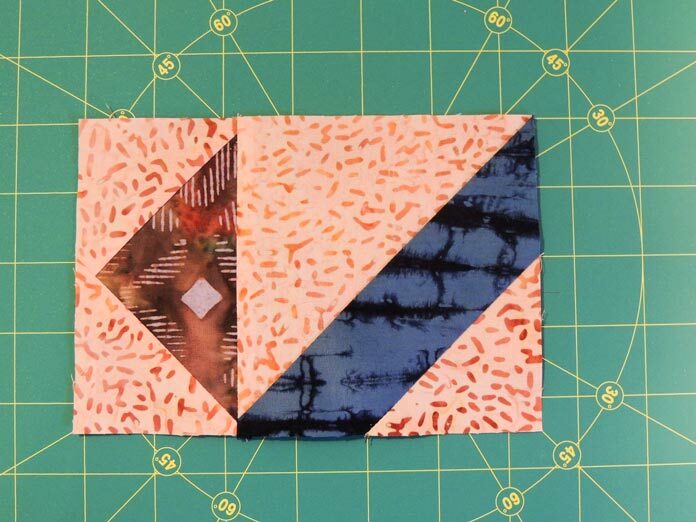 Sew one Fabric D 2½” square to the left side of one Fabrics BC flying geese unit; press the seam to the Fabric D square. 3. Sew the bottom edge of the Fabric D square and BC flying geese unit to the top edge of the geese/HST unit; press the seam to the Fabric D square/BC flying geese unit. Step 3 for corner block assembly. 4. Sew one long edge of Fabric E 2½” x 6½” rectangle to the left side of new unit with Fabric D square at top – see photo for orientation. Press the seam to the Fabric E strip. Step 4 for corner block assembly. 5. Sew one Fabric B 2½” square to one short end of one Fabric E 2½” x 6½” rectangle; press the seam to the Fabric E strip. 6. Sew the Fabric B square/Fabric E strip unit to the top edge of the unit assembled in step 4; press the seam to the Fabric B/Fabric E strip. The block corner unit should measure 8½” square. 7. Repeat steps 1-6 three more times to make 4 identical block corner units. 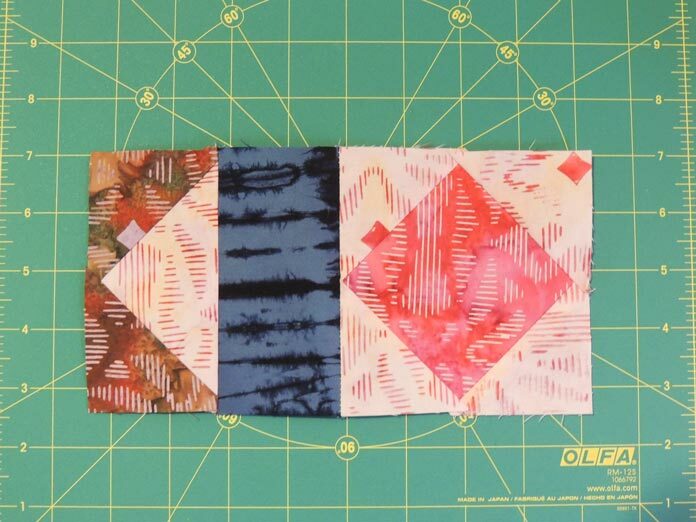 Take a moment to really enjoy the visual contrast and texture of the Shibori print with the iKat Sketch fabrics. I find the Ketan batik reminds me of cinnamon! 1. 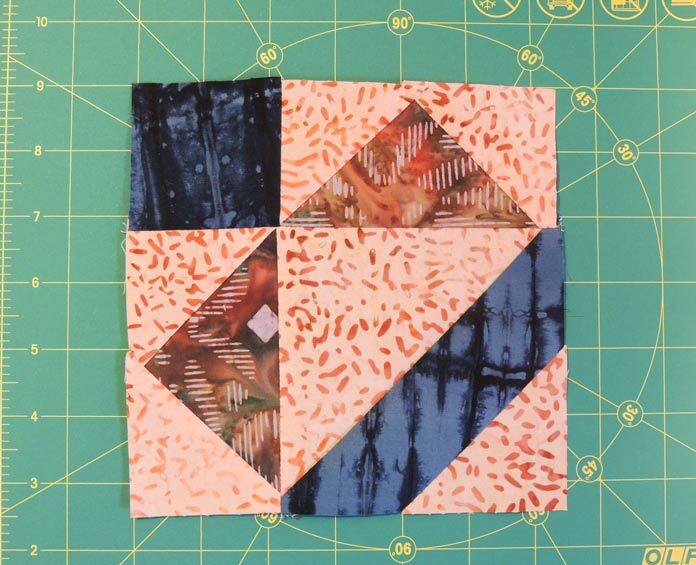 Sew the Fabric E edge of the EB flying geese units to the remaining long side of the Fabric D strip/square in a square unit; press the seam to the flying geese unit. 2. Repeat with remaining EB flying geese units to make a total of 4 identical middle blocks. See photo. If you put everything together properly, you should still have one square in a square unit left. Yay you! This will be the center of the cushion when we put the rows together tomorrow. I hope you’ve enjoyed watching the Banyan Batiks start to bloom into the boho inspired cushion cover. Thank you for the chance to win those beautiful Banyan Batiks.